Plush faux fur trims the chill-blocking hood that helps protect from the elements on this water-repellent, chevron-quilted puffer coat. A stretchy belt defines the waist and enhances the draft-free fit. 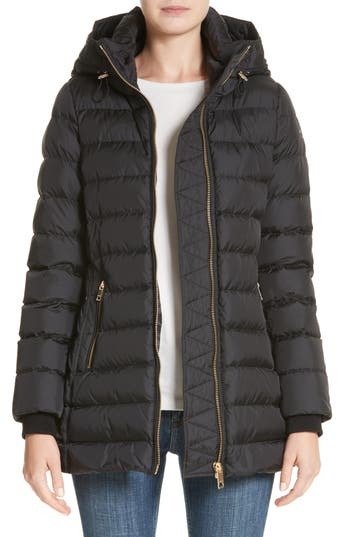 Style Name: Wallis Water Repellent Quilted Puffer Coat With Faux Fur Trim (Regular & Petite). Style Number: 5502039. Available in stores. A stretchy belt with a logo-stamped metal plate cinches the waist to flatter the feminine figure in this long, channel-quilted coat crafted from water-repellent nylon. Detachable fox fur trim frames the attached hood for a lavish touch, while 180-200 grams of lofty Boudin-injected goose down provide luxurious warmth. Style Name: Moncler 'Khloe' Water Resistant Nylon Down Puffer Parka With Removable Genuine Fox Fur Trim. Style Number: 5165973. Available in stores. 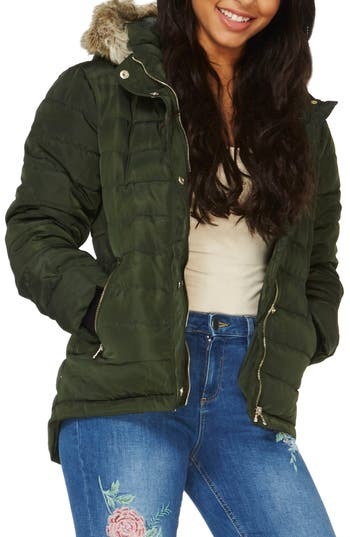 Designed with more feminine proportions, this channel-quilted puffer jacket continues to flatter with waist-nipping darts and elastic banding at the back. Water-repellent nylon and lofty down-and-feather fill ensure comfortable warmth whether worn in the snow or the city. 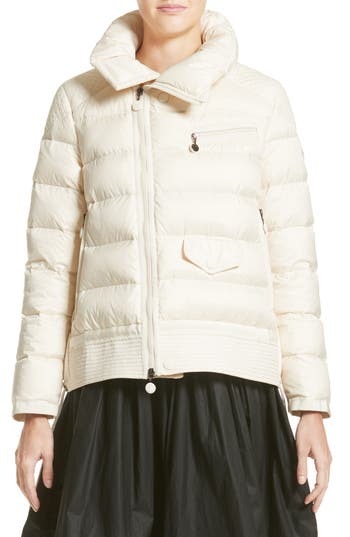 Style Name: Moncler Danae Down Puffer Jacket. Style Number: 5362543. Available in stores. A feminine twist on a Moncler favorite, an ultra-lightweight puffer jacket in water-repellent nylon is flounced with a gathered peplum hem. 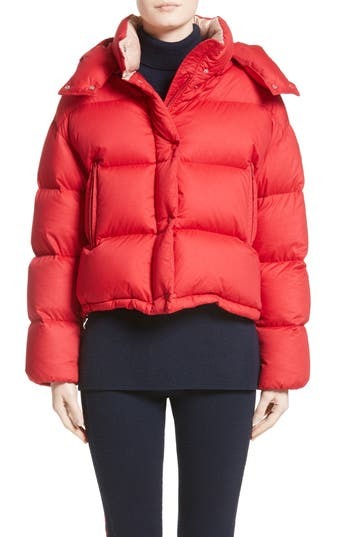 Style Name: Moncler Anet Peplum Down Puffer Jacket. Style Number: 5362527. Available in stores. Adjustable bungee cords create fluted cuffs on this down puffer jacket for a high-fashion spin on high-performance skiwear. Chevron quilting insulated with lofty down-and-feather fill provides comfortable warmth without added bulk. 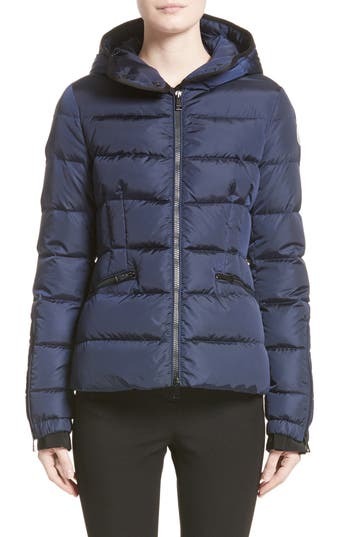 Style Name: Moncler Solanum Down Puffer Jacket. Style Number: 5362488. Available in stores. Plush faux shearling lines the hood and neck of this toasty-warm puffer jacket in a playfully oversized silhouette grounded with finely ribbed knit trim. Style Name: Guess Oversize Hooded Puffer Jacket With Knit & Faux Shearling Trim. Style Number: 5366734. Available in stores. A lush ring of dyed Finnish fox fur crowns the hood of a channel-quilted coat insulated with 180-200 grams of lofty Boudin-injected goose down to provide superior warmth in plummeting temperatures. For added protection from the elements, the cold-weather essential is crafted from Moncler's new satiny fabric, which boasts a lustrous sheen and a water-repellent finish. Grosgrain trim along the placket and a waist-cinching belt with a logo-stamped metal plate add signature finishing touches. 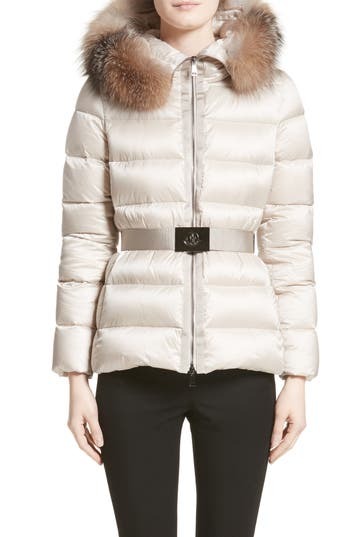 Style Name: Moncler 'Tatie' Belted Down Puffer Coat With Removable Genuine Fox Fur Trim. Style Number: 5165810. Available in stores. 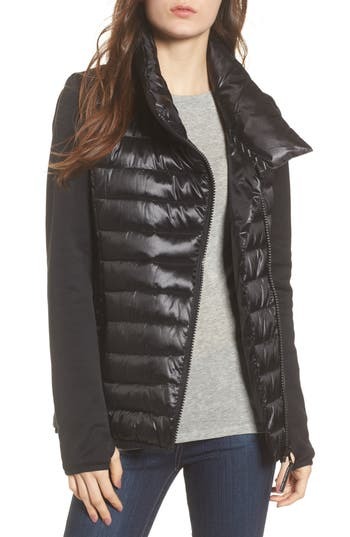 Big baffle quilting gives a cozy, pillowy fit to this hip-length puffer. Style Name: Bernardo Oversize Puffer Jacket. Style Number: 5410606. Available in stores. Strategic seaming and quilting at the back, along with lace-up details at the cuffs, brings an alluring lingerie-inspired look to a cozy puffer jacket. A detachable hood crowned with fluffy faux fur lends posh style and extra warmth and protection. Style Name: Kensie Lace Sleeve Puffer Coat With Faux Fur Trim Hood. Style Number: 5387404. Available in stores. Moncler merges classic moto styling and cool-weather comfort on this channel-quilted jacket designed with biker-inspired leather paneling and trapunto-stitched shoulders. Premium down fill provides warmth in a wide range of temperatures, while water-repellent nylon legere at the sleeves and back offers rugged practicality. 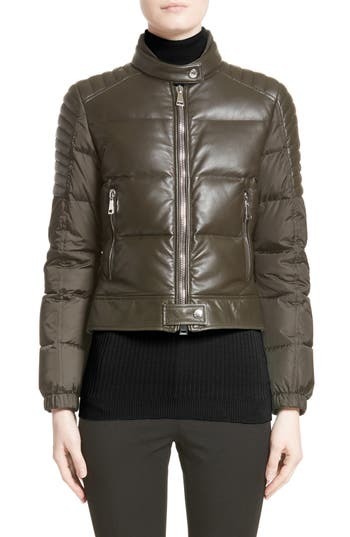 Style Name: Moncler Clematis Leather Trim Down Puffer Jacket. Style Number: 5362489. Available in stores. 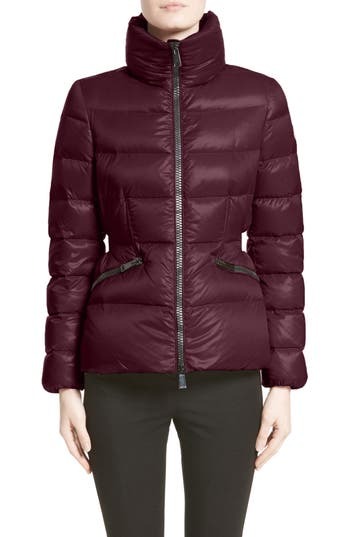 Shiny, color-blocked nylon and deep red trim hint at the vintage inspiration behind this sporty-chic puffer jacket filled with a premium down-and-feather insulation that will keep you warm and looking chic from city to countryside. Style Name: Moncler Cotinus Hooded Down Puffer Jacket. Style Number: 5362538. Available in stores. 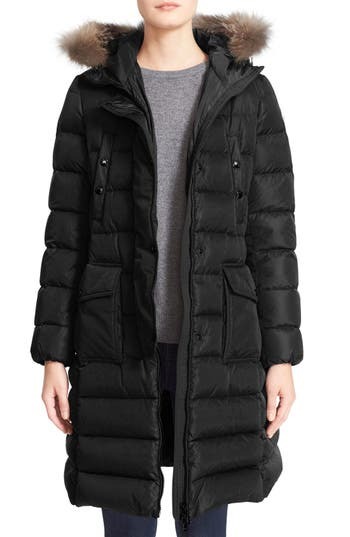 Designed with flattering proportions and high-performance details, a channel-quilted coat insulated with premium down is darted at the waist to emphasize the feminine figure. Gusseted zip cuffs and a high scuba-style hood protect from cold wind, making it suitable for both mountain and urban adventures. 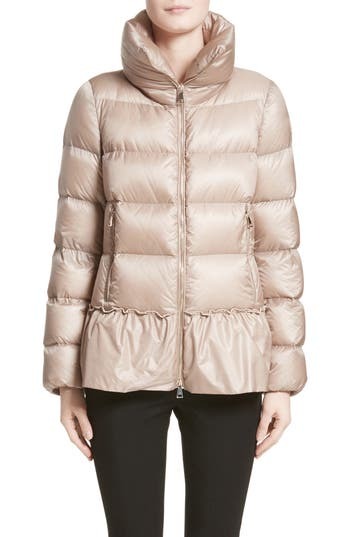 Style Name: Moncler Betula Down Puffer Jacket. Style Number: 5362544. Available in stores. Moncler pulled an iconic '80s outerwear design from the archives, then reworked it with an ultra-lightweight construction and a shorter, more contemporary fit. Premium down fill and a detachable hood offer the same expected warmth and comfort. 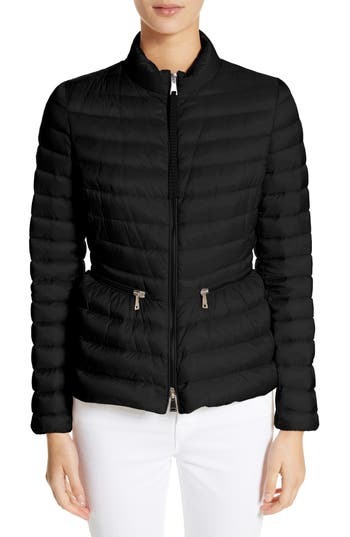 Style Name: Moncler Paeonia Quilted Puffer Jacket. Style Number: 5362492. Available in stores. Rich velvet adds a chic and luxurious touch to a classic cold-weather puffer, insulated for optimal warmth. Style Name: Lewit Velvet Puffer Jacket. Style Number: 5363184. Available in stores. A soft ruff of faux fur traces the roomy hood of a sporty puffer jacket strategically shaped by mixed quilting and warmed by substantial synthetic fill. 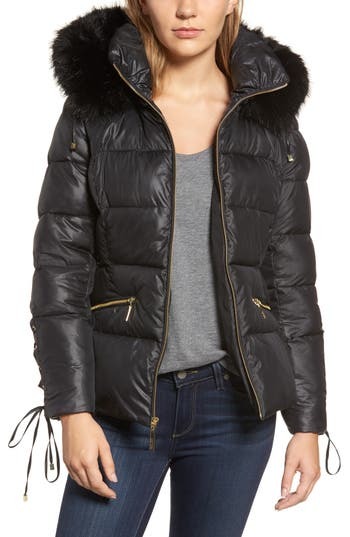 Style Name: Guess Quilted Hooded Puffer Coat With Faux Fur Trim. Style Number: 5420874. Available in stores. Ideal for apres-ski drinks at the lodge, this plush puffer is cinched with a belt and topped with a fluffy faux fur-trimmed collar. 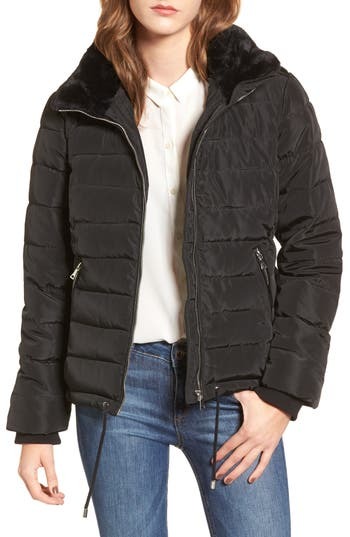 Style Name: Ted Baker London Puffer Jacket With Faux Fur Collar. Style Number: 5468147. Available in stores. Designed with subtle '60s references, this shiny, coated bomber blends retro inspiration with modern, high-tech details. Drawstrings at the waist and hem are not only flattering-they keep out the cold and flounce the contrasting pleated hem. 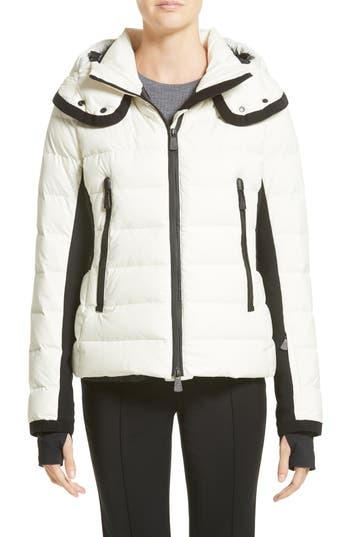 Style Name: Moncler Lucy Peplum Down Puffer Jacket. Style Number: 5383842. Available in stores. Contrasting side panels and exaggerated zip pockets visually nip the waist in this channel-quilted puffer coat insulated with premium down fill. Thumbhole cuffs and an adjustable toggle hood offer additional warmth on the slopes, while signature grosgrain trim complements the graphic black-and-white styling. 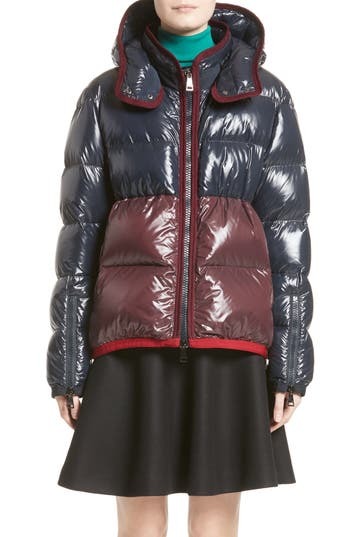 Style Name: Moncler Lamoura Quilted Down Puffer Coat. Style Number: 5383834. Available in stores. Inspired by both lunar voyages and vintage aviator style, this down-insulated puffer jacket is primed for cosmopolitan adventure-seekers and explorers. Diamond and channel stitching borrow from classic flight designs, while a drawstring hem creates a balloon effect evocative of inflated spacesuits. 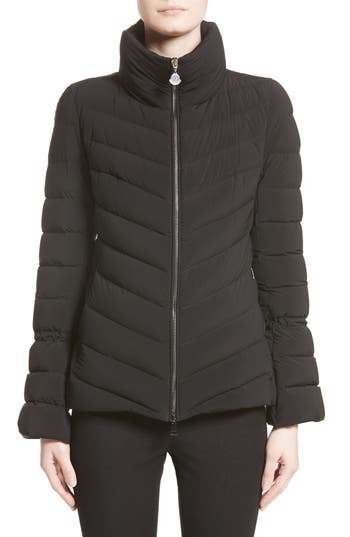 Style Name: Moncler Margaret Down Puffer Jacket. Style Number: 5383841. Available in stores. A glossy, lacquered finish gives new shine to a water-repellent, channel-quilted puffer coat insulated with premium down fill. The high stand collar and detachable drawcord hood block wind, while wool-and-cashmere insets on the undersides of the sleeves ease movement. 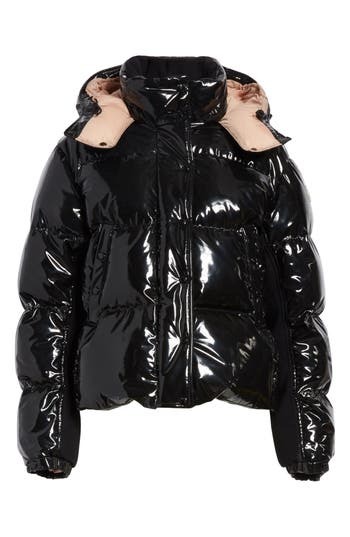 Style Name: Moncler Gaura Shiny Down Quilted Puffer Coat. Style Number: 5362541. Available in stores. The buckled belt of this quilted puffer coat can be knotted around the waist to make the tailored silhouette even more flattering. Down insulation and a drawcord hood offer cold-weather comfort, while a check-print lining provides a signature touch. 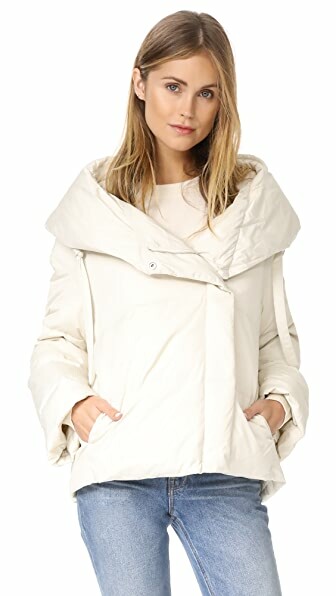 Style Name: Burberry Limefield Hooded Puffer Coat. Style Number: 5449307. Available in stores. Signature grosgrain trim refines this collarless puffer jacket, which combines lightweight, water-repellent nylon with direct-inject down fill to provide comfortable, year-round warmth. Belled cuffs flared by drawcords complete the look with easy femininity. 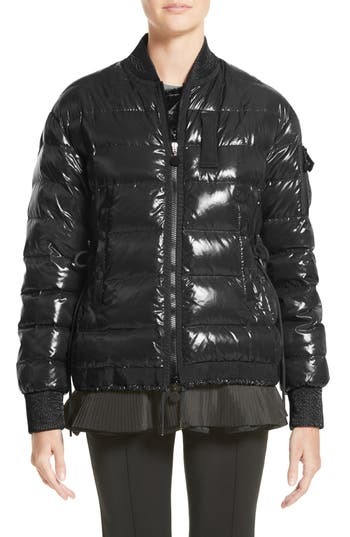 Style Name: Moncler Almandin Quilted Puffer Jacket. Style Number: 5464127. Available in stores. 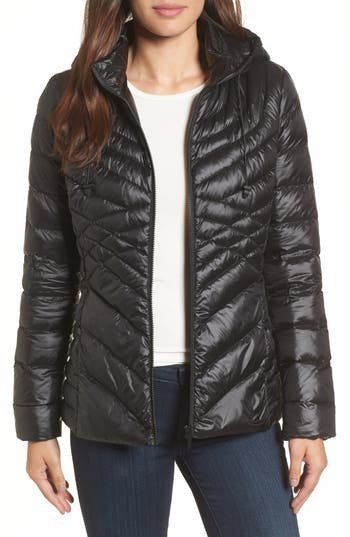 Silvertone zippers highlight the smallest part of the figure in this channel-quilted puffer jacket crafted from water-resistant nylon legere. Designed to flatter, it's contoured by princess seams and waist-nipping darts in back. 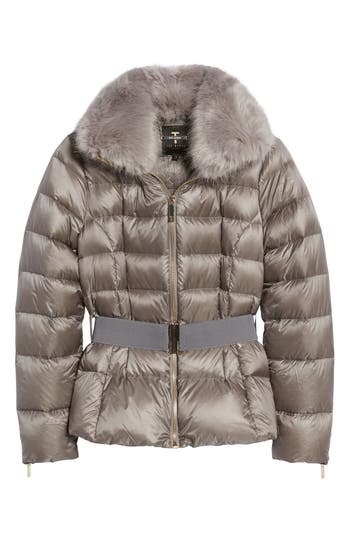 Style Name: Moncler Agate Quilted Puffer Jacket. Style Number: 5464157. Available in stores. Sumptuous faux fur trims the hood to bring face-framing warmth and elegance to a cozy puffer jacket textured with channel quilting and polished with goldtone hardware. 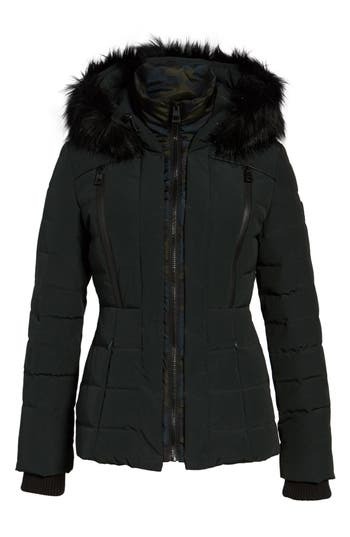 Style Name: Dorothy Perkins Faux Fur Trim Hooded Puffer Jacket. Style Number: 5491895. Available in stores. A subtle high/low hem puts a polished finish on an essential winter puffer insulated with a lightweight down-blend fill. Style Name: Halogen Hooded Down Blend Puffer Jacket. Style Number: 5395631. Available in stores. A drawstring waist puts a contemporary finish on an essential puffer equipped with a stowaway hood and plush faux fur lining. 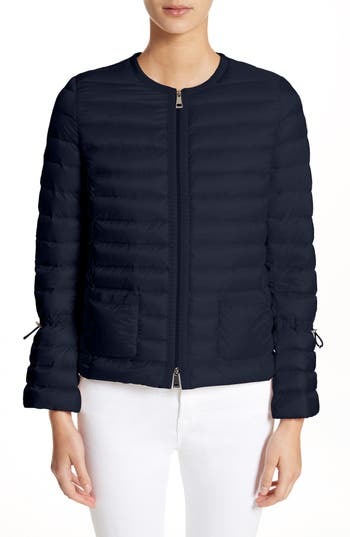 Style Name: Dorothy Perkins Puffer Jacket With Faux Fur. Style Number: 5501178. Available in stores. 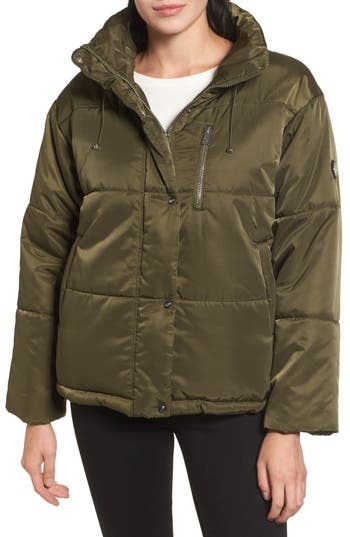 Perfect for layering over chunky knits, this cozy puffer is insulated with lightweight fill and topped with a wind-shielding hood trimmed in faux fur. 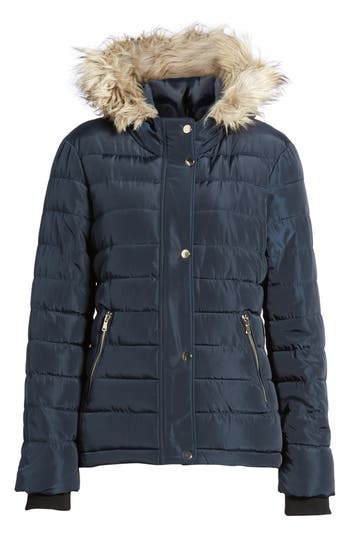 Style Name: Dorothy Perkins Hooded Faux Fur Puffer Jacket. Style Number: 5501180. Available in stores. Contrast sleeves in a cozy fleece knit add a cool, layered look to this sleek, packable jacket textured with slender channel quilting. 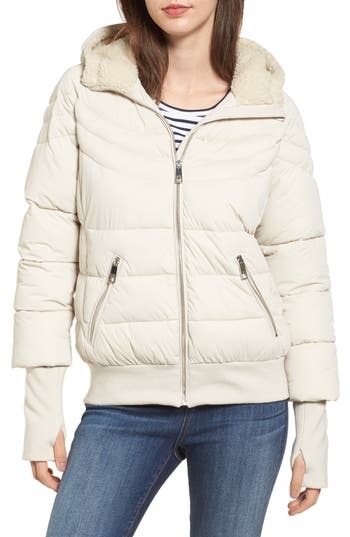 Style Name: Marc New York Knit Sleeve Packable Puffer Jacket. Style Number: 5501675. Available in stores.